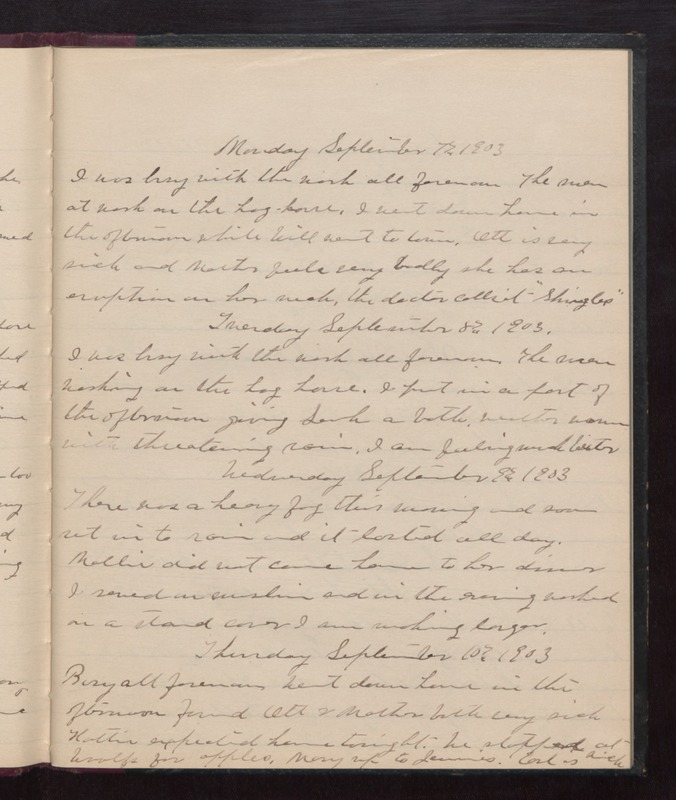 Monday September 7th 1903 I was busy with the work all forenoon. The men at work on the hog house. I went down home in the afternoon while Will went to town. Ott is very sick and Mother feels very badly she has an eruption on her neck, the doctor called it "Shingles." Tuesday September 8th 1903 I was busy with the work all forenoon. The men working on the hog house. I put in a part of the afternoon giving Sarah a bath. weather warm with threatening rain. I am feeling much better. Wednesday September 9th 1903 There was a heavy fog this morning and soon set to rain and it lasted all day, Mollie did not come home to her dinner. I sewed on muslin and in the evening worked on a stand cover I am making larger. Thursday September 10th 1903 Busy all forenoon. went down home in the afternoon found Ott & Mother both very sick. Hattie expected home tonight. We stopped at Woolfs for supper. Mary is to Jennies. Earl is sick.